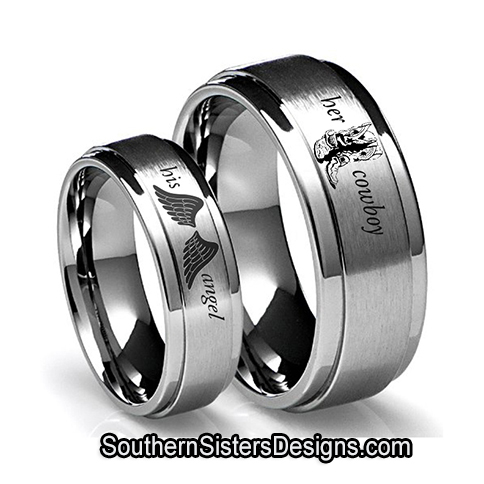 Southern Sisters Designs is unveiling our new black camo midnight wedding engagement ring along with the matching black band camo ring for men. We have all sizes ranging from engagement rings sized from 4 to 11. These are titanium with cubic zirconia stones. The band rings for men are sized from 7 to 16. These bands are tungsten. All rings have a 1 year warranty including the engagement rings. Contact us with any questions. Order these now as they sell out fast – order before the Valentines rush! Love Orange Camo? Yes, we have the orange camouflage rings are back in stock including the stone rings. We have matching matching bands. All sizes are now back in stock just in time for Valentines! Order now as they will sell fast. We have titanium and both tungsten bands. Check them out by visiting our site to see all of our county girl and southern girl rings. Black Camo Rings For Wedding, Engagement, Promise, Friendship and more. These are top sellers but they sell fast so order now at a super low price. Valentines is coming up and these ring sets will sell fast! Midnight Black Camo has become one of our favorites and a customer favorite. We have band rings and engagement wedding rings. The Black camouflage pattern is our own! Looking for a great couples ring set for the country girl – here you go. We have many different ring sets for him and her that are unique and not found elsewhere. 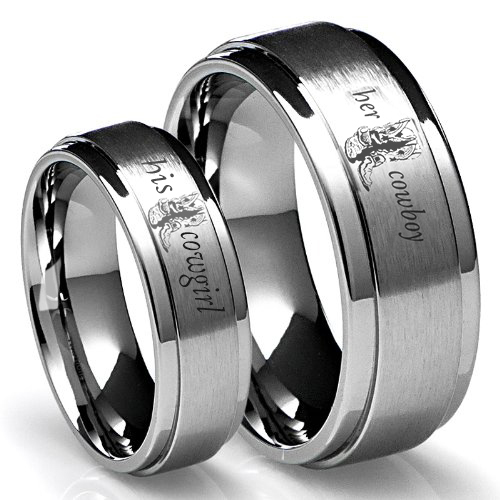 These are high quality tungsten and titanium rings that are sold as a set or sold individually. We also have Her Cowboy and His Cowgirl that has quickly become a top seller. This is a great gift for couples and can be used we promise rings, wedding, couples and much more. These are perfect for any cowboy and cowgirl out there. These are made from either titanium or tungsten. See all of our Country and Southern Style rings that are made just for couples or specific situations. Are you wanting something special for your Valentine this year? These camouflage boy shorts are loved by both customers and staff! They comes in multiple different colors. These purple and orange ones are a nice change to the typical camo. These come in sizes Small-3XL and multiple different colors. $12.95 each! Great gift for the country girl in your life, especially if she loves the outdoors and camo! We also have the matching camisole and other pieces. To view all of our lingerie items, click the link below. Some of our newest top sellers are these King & Queen items. They are sold in sets, perfect for any couple. We have t-shirts, hoodies and even jewelry printed with the King and Queen on them. These make great gifts for holidays, like Valentine’s Day, but also for birthdays, anniversaries and weddings. We also sell some of the items individually, like our Queen bathing suit. Valentine’s Day is just around the corner, order now! Click below, to view our King & Queen collection.